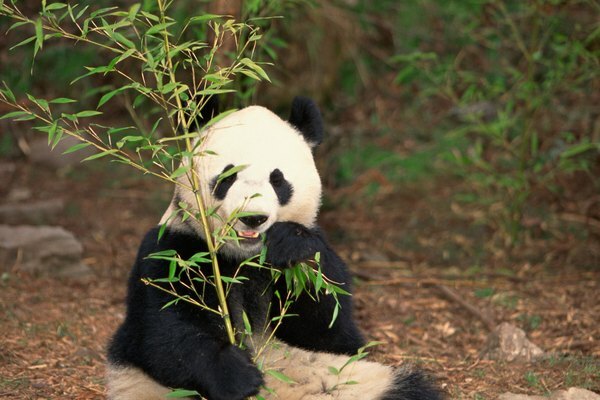 The giant panda spends most of its day searching for and eating bamboo. The giant panda uses the remainder of its day to rest. Because giant panda bears do not hibernate like other bears, the giant panda's genetic adaptations are very important to its survival. 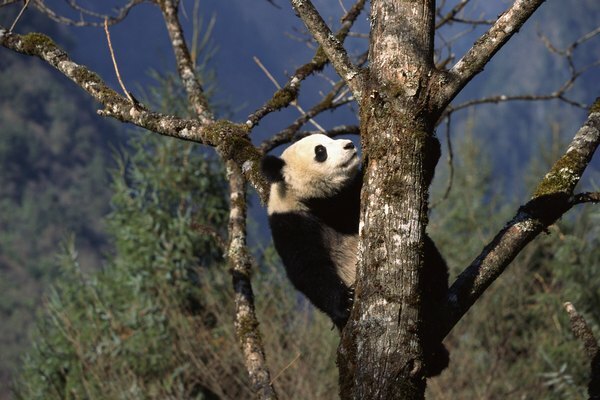 The giant panda's genetic adaptations allow the giant panda to easily forage for, consume and digest bamboo, since the giant panda must search for food on a year-round basis. The Giant Panda's "Sixth Toe"
Though the giant panda has the five toes one would expect to find on a bear's paw, giant pandas have developed a "sixth toe" which helps the giant panda better grasp the bamboo when eating. The "sixth toe" originates from the giant panda's wrist bone, which gives the giant panda the extra strength needed to tear the shoots and leaves from the bamboo stems. This extra toe is crucial to the giant panda's survival, as 99 percent of the giant panda's diet consists of bamboo shoots and leaves. Since the bamboo plant is such a durable and resilient plant, the giant panda had to develop strong jaw muscles to be able to eat bamboo. As a result, giant panda bears also developed an enlarged cranial cavity that can comfortably house the strong jaw muscles necessary to chew through bamboo. These adaptations allow the giant panda bear to comfortably chew for extended periods of time, so that the giant panda may eat as much bamboo as necessary to maintain proper nutrition. 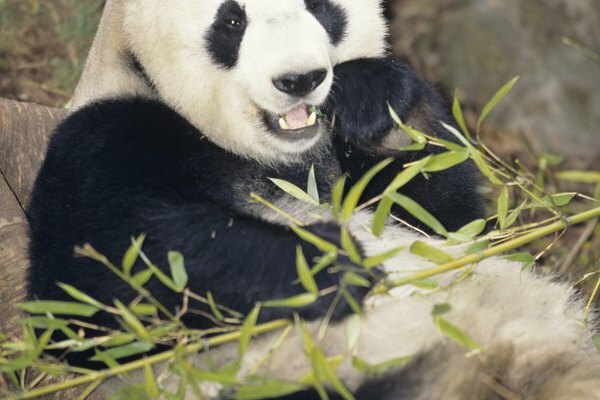 Along with strong jaw muscles, the giant panda needs the proper teeth to be able to chew through the bamboo plant. Over the centuries, the giant panda bear developed molars that were smoother and larger than a normal bear's molars. Since the giant panda's diet mainly consists of bamboo, unlike other bears, the giant panda rarely uses its canine teeth, as the giant panda very seldom needs to kill and tear through the flesh of other animals. The giant panda's digestive system must be strong enough to handle consumption of bamboo. The lining of the giant panda's esophagus is reinforced so the bamboo fibers cannot break through on its way down to the stomach. The stomach also has a tougher lining, as well as stronger muscles, to aid with the digestion of the tough bamboo. 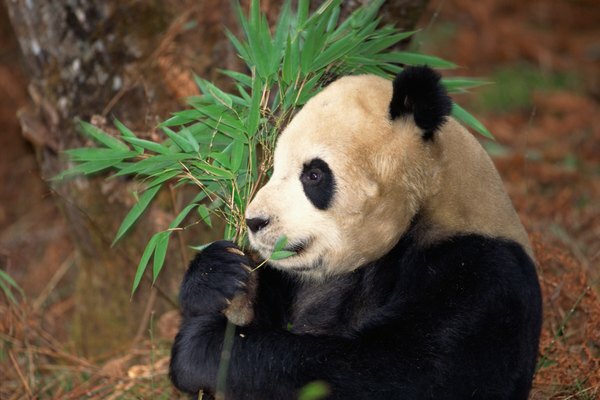 Bamboo's high cellulose content forces the bamboo through the giant panda's digestive system fairly quickly; the shortened intestines the giant pandas developed allows for this passage to be swift. The colon has also changed to accommodate the giant panda's exclusive bamboo diet. 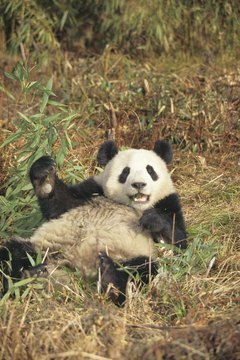 Since giant pandas do not usually drink water more than once a day, they do not pass waste as often as other creatures. The larger colon allows the giant panda to consume its enormous bamboo diet by helping the giant panda control its waste for longer periods of time, thus limiting the amount of times a giant panda must stop for restroom breaks. Since giant pandas spend a great deal of their lives foraging for bamboo, their legs have strengthened over time to handle the bear's weight. 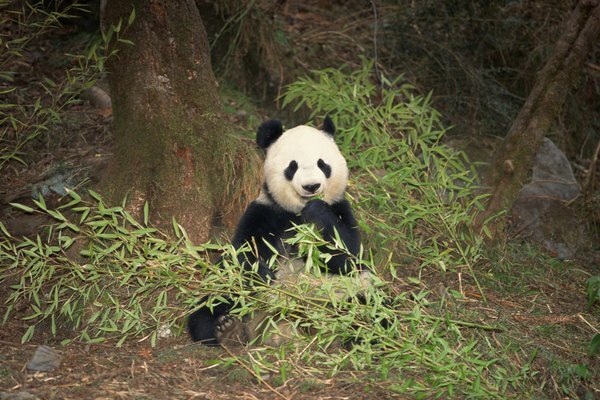 A giant panda can consume anywhere from 20 to 40 pounds of bamboo in a single day. Giant pandas average at a weight of about 250 pounds for males and up to 220 pounds for females due to all of this bamboo consumption. The giant panda's legs must be able to carry this weight over long distances and up high trees for an average of 10 to 16 hours every day, to allow the panda bear to maintain the proper nutrition levels necessary for survival.